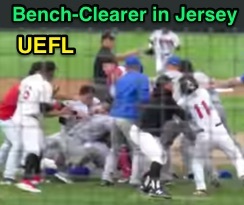 A contentious home plate collision begot New Jersey Jackals pitcher Mat Latos to throw at a Rockland Boulders batter, which sparked a bench-clearing brawl Saturday in the independent CanAm League, with Latos & Rockland's Ryan Deemes ejected for fighting. A massive brawl breaks out after inside pitches. The friction began with none out in the top of the 6th inning, when, with a runner on first, Boulders batter Conrad Gregor hit a double to the left-center field gap. As baserunner R1 Marcus Nidiffer approached home plate, Jackals catcher Kevin Torres fielded the incoming throw and applied a hard tag, resulting in a collision during which the ball came free and Torres appeared injured, resulting in a bench-clearing incident. When play resumed following an apparent appeal at third base (denied) and declaration that baserunner Niddifer was safe at home, Latos took matters into his own hands and greeted ensuing Boulders batter Kevin Krause with an inside fastball, thrown at Krause's midsection, for a called first ball. Benches clear after a collision at home plate. Latos' second pitch to Krause was further inside and thrown at Krause's head; the batter ducked and the benches cleared as Krause slowly walked toward the pitcher's mound; before he could get there, Deemes had charged off the bench and threw a punch at Latos, resulting in a brawl near the mound as both Latos (throwing at) and Deemes (fighting) were ejected from the contest. The Jackals ultimately won the game, 5-3.